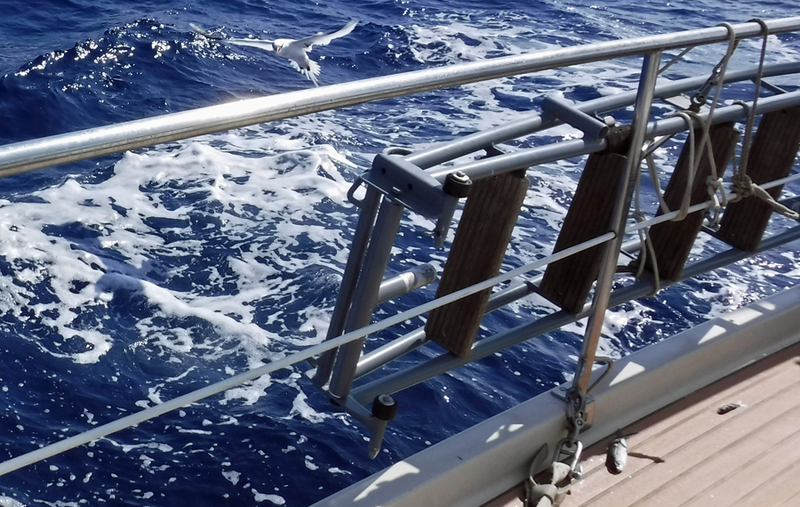 It’s my job to throw the dead fish off the deck in the mornings when we are underway. I do this each morning before they start to bake in the sun and stink up the place. They will also stain the deck if left stranded. We had nine dead fish on our second night out. These are flying fish, the suicidal type. For some reason they jump onto the boat after dark. Some are quite large. A couple of years ago we had a fish come flying into the cockpit during the middle of the night. It made Cindy scream. I got to play hero and grabbed the smelly little bugger and tossed it back. I’m not fond of doing this. 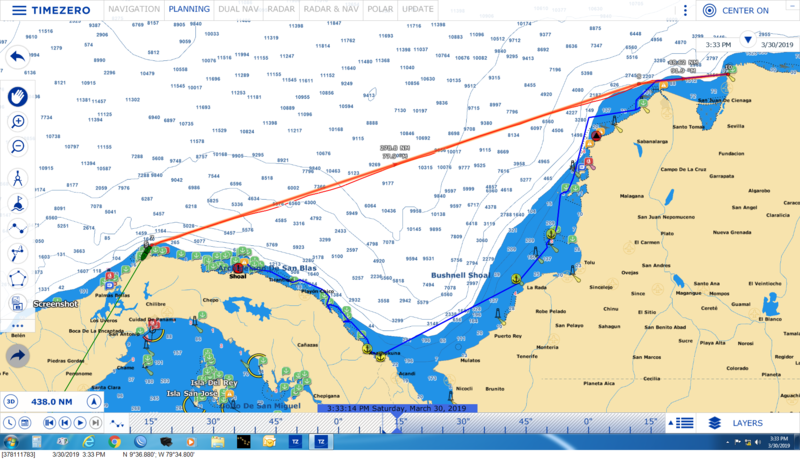 We are planning to island hop along the Colombian coast until we reach Panama. When we reach Panama we’ll check in at a little town called Puerto Obaldía. This is a tiny little town barely visible on Google maps. But lucky for us, located there are customs and immigration officials. Sailing north from this town we will begin to explore the San Blas Islands. Yeah. That didn’t happen. I was never really happy about what I had read about checking into Panama at Puerto Obaldía. 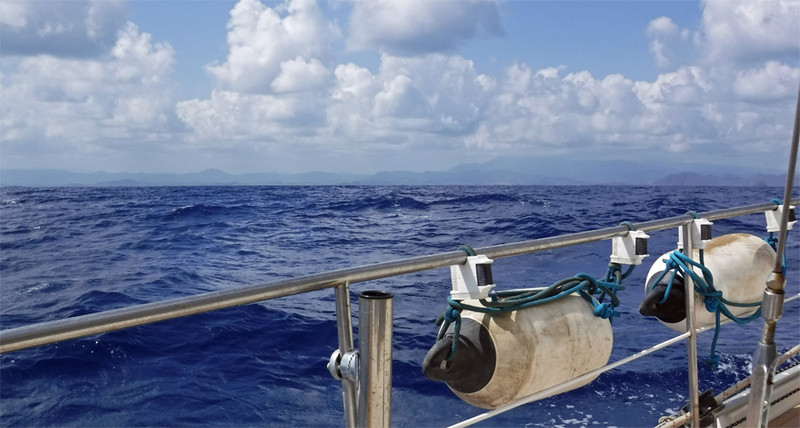 The bay can be very rolly making it unsafe to leave the boat on anchor during the check in process. The dinghy dock located there needs some help and requires the skills of an orangutan to scale it. These thoughts just weren’t sitting well. 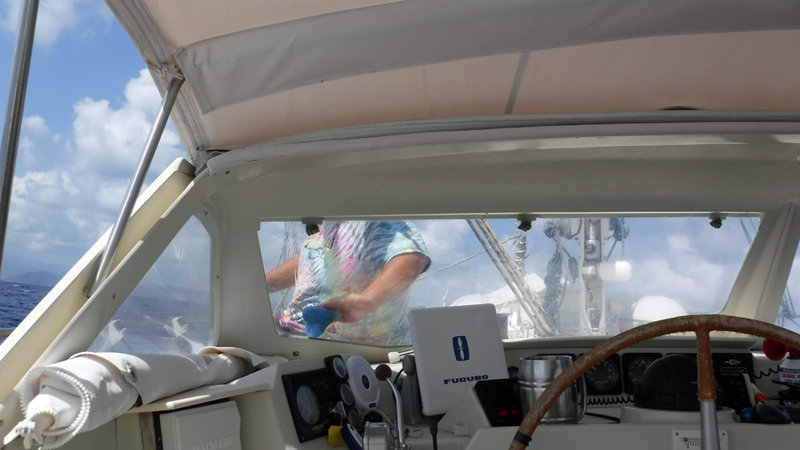 To top it off, once we had checked in, the winds would be on the nose as we headed up to the San Blas Islands meaning we’d need to motor. At the last minute we changed our minds and decided to go a different route. 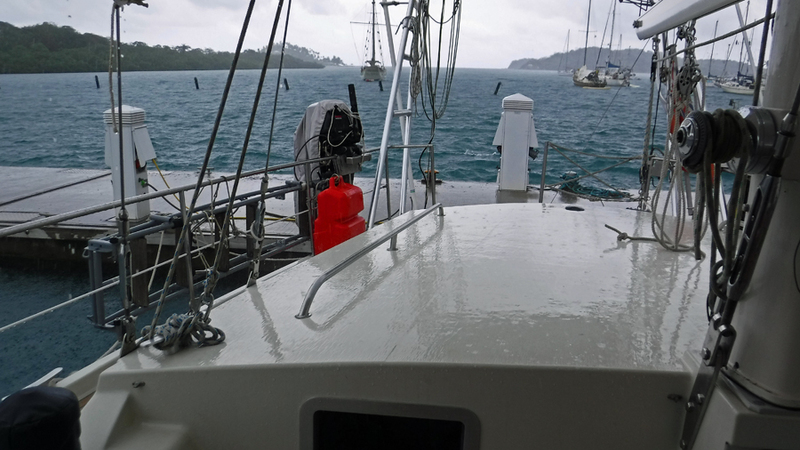 We saw a fantastic weather window with consistent 20-25 knot winds on the hind quarter allowing us to sail the 2 nights and 3 days from Santa Marta all the way to Puerto Lindo, Panama. The icing on the cake was a full moon up all night and no chance of rain. The moon was so bright it was like sailing at dusk all night long. Puerto Lindo is just north of the San Blas islands and we can check in with customs and immigration at this port before back tracking a little bit to the San Blas islands. The new plan puts us in the area about a week earlier than planned. More time to enjoy these beautiful islands. On our sail over to Panama, we passed the Magdalena River flowing out of Barranquilla Colombia. This is a massive river. Several sailing guides and other cruisers warn against debris floating in this area. Apparently it is not unusual to see large trees, farm animals or big logs as hazards. Hitting a tree or a large log would not be a good thing for a fiberglass boat. The ocean in this area is always a little bit of a concern since it is often one of the windiest points of the Colombian coast. 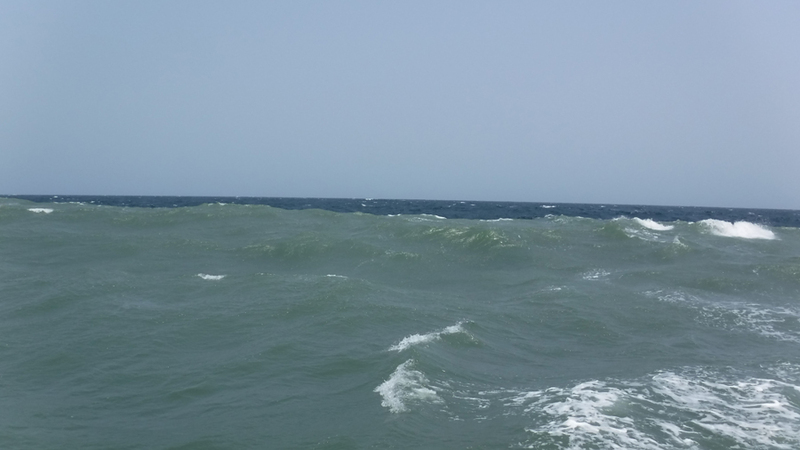 Mixed with the high winds is a churn of freshwater trying to mix with saltwater. This causes what Cindy and I refer to as a washing machine effect. It makes for a rather uncomfortable ride and causes boat to rock and turn (sometimes violently) in a multitude of directions. We passaged across the area on a calm day and after experiencing the churn can honestly say I am so glad we waited for a good weather window. We didn’t see any debris while keeping a keen eye on the water ahead of Cream Puff. The part of this area I found truly amazing was the sharp contrast between the deep blue water of the ocean and the gray colored water containing a mix of the river and ocean. I was expecting a gradual change between the colors but this wasn’t the case. The change was as sharp as a pencil line. The front of our boat was in the grey colored water and the back was in blue water. I grabbed the camera just in time. If you look carefully at the picture below you can see waves going in three different directions and just past the wave is the deep blue ocean water. I think I previously mentioned how Santa Marta, Colombia has a wet and dry season. We were there in the dry season and never saw a drop of rain during our entire stay there. 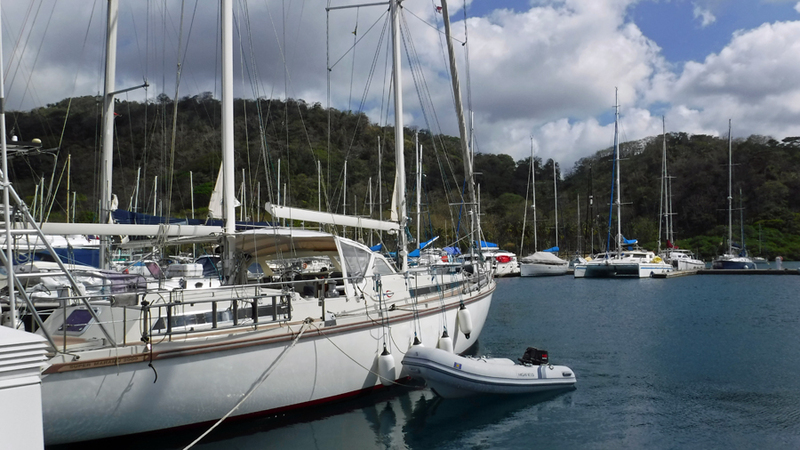 We parked at Linton Bay marina for a couple of days so we can check-in with the Panamanian authorities. This required us to take about a twenty kilometer bus ride to the government building. We arrived on Friday and customs told us to wait until Monday for immigration. No big deal. We thought we’d chill in the marina here for a couple of days. Then hallelujah! It rained. It has been exactly 120 days since we last saw rain. Cream Puff was parked in Aruba and it rained on us the day before set sail from there to Santa Marta. I was so excited! I was actually washing the boat taking advantage of the free water in the marina when it began to rain. I just kept working in the rain. It felt so refreshing. Awesome! 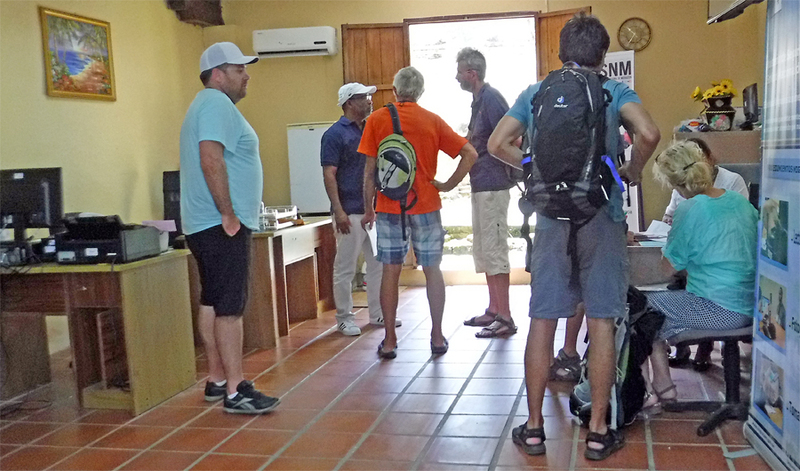 We checked in with the customs office located in the marina compound. It was a Friday. It is not unusual to have to pay fees for a Cruising Permit in some countries. 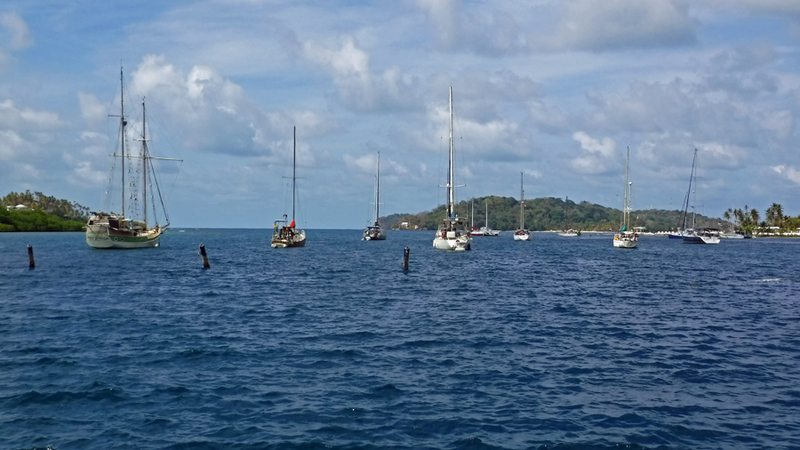 A Cruising Permit allows our vessel to sail in Panamanian waters tax free and import duty free for up to one year. This can be extended if we decide to stay longer. I mention it was Friday as often counties have overtime fees if we check in on a weekend or after hours. The customs officer tried to explain in English this particular Friday was a holiday and the immigration office was closed. He told us we could report to immigration on Monday with no problems. He checked us in and told us since we were getting a Cruising Permit on a holiday we would need to pay the overtime fee. Our understanding was the normal fee to customs was about $200. He quoted $225. We figured $25 for the overtime fee was okay. On Monday we took a bus for the 20 km trip into the small town of Portobelo. The bus runs once in the morning and returns once in the afternoon. We sat at the bus stop at 9:15 waiting for the 9:30 am bus. We were educated by some British cruisers about the bus system. Parking our hinnies on the bench at the stop we prepared to wait until 10am for the bus. Apparently not much runs on time in this part of Panama. About 9:30, a bus came from the wrong direction. It stopped. The driver motioned to us to get on. We said, “Portobelo” and pointed the correct direction the bus should be going. He responded with, “Sí, sí, Portobelo” and motioned for us to get on the bus. We climb aboard wondering where we might be going. It turns out this bus driver had a time saving method to getting passengers on his bus. The bus ran for about 10 km in the wrong direction before the end of the line and turning around. He picked up people regardless of which side of the street they were waiting. I could now see the logic. Pick them all up and there is no need to stop on the return route. 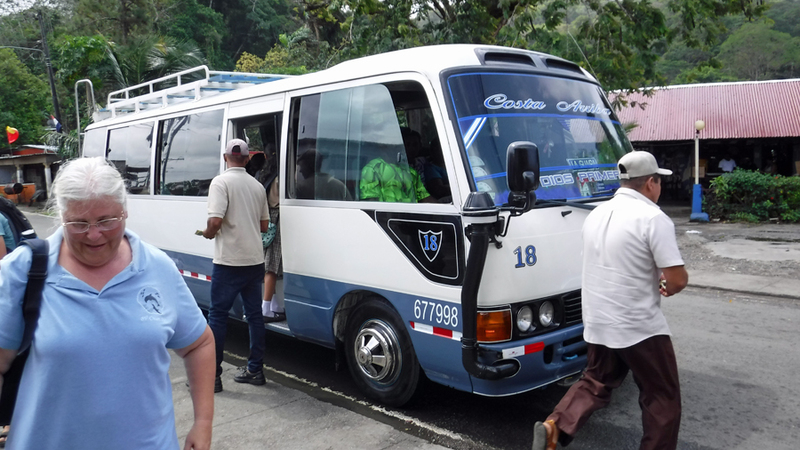 At the end of the line the bus made the u-turn and started to head to Portobelo with most of the passengers staying aboard. I was a little relieved we were now going the right direction. Normally a person getting on the bus with a chain saw might get a second look. Not here. People carried all sorts of things onto the bus. One passenger had two propane tanks and the conductor stored these in the trunk. There are no real bus stops. People wait on the side of the road raising their hand motioning for the bus to stop. I am not sure how the driver understood the difference between people just waving at the bus and those wanting to get on. Everyone waves at the bus. A lot of school kids got on and it was nice to see them give up a seat to a mom traveling with two youngsters. Some parents are teaching their kids well. As you can imagine, the bus is now getting pretty crowded and there is no air conditioning. The windows are open and the sound of the engine is straining as we go uphill. I can smell the diesel fumes. 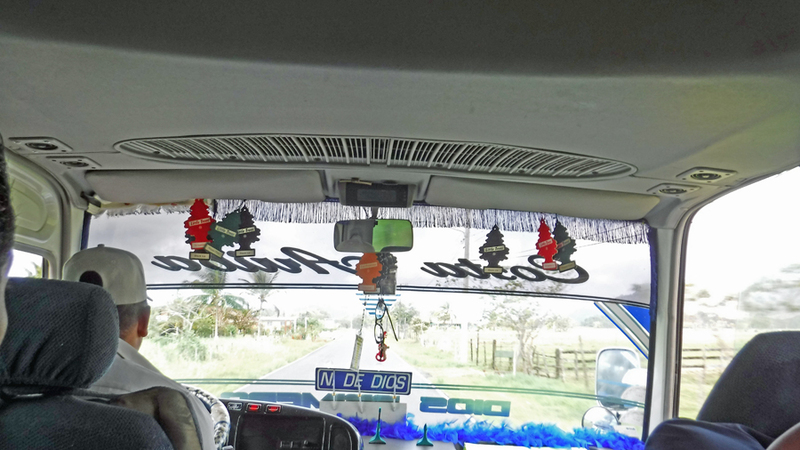 Spanish music blares as the bus barrels down the narrow road. At this point, I am trying to understand if Panamanians drive on the left or right side or the road. It was impossible to tell with our bus because there was never a time when all the wheels were in the same lane. 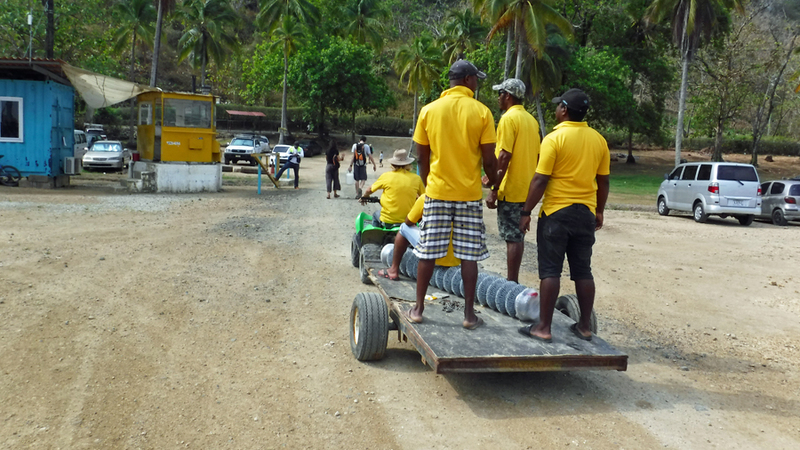 We arrive in Portobelo. 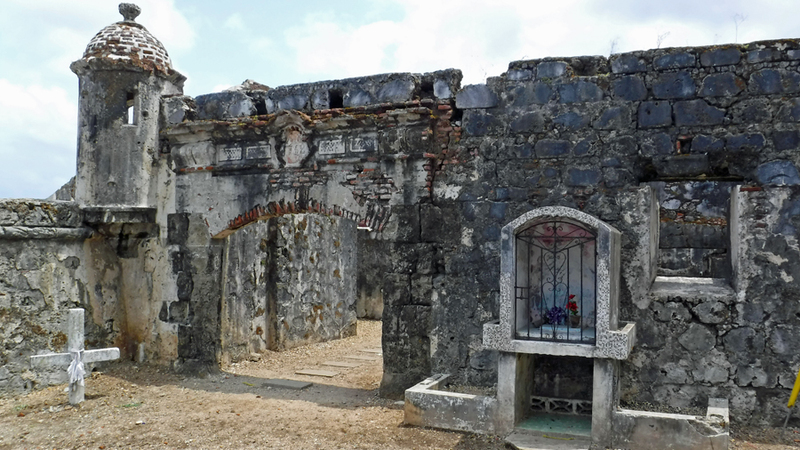 I confirmed this by asking the lady near me if this is Portobelo, “Si Señor”. Okay, all is good. We are in the right town now we just need to locate the immigration office. Not to worry. The town is not very big. It barely made Google maps. It has two streets about 4 blocks long. According to Wikipedia, legend has it that Christopher Columbus originally named the port “Puerto Bello”, meaning “Beautiful Port”, in 1502, After Francis Drake died of dysentery in 1596 at sea, he was said to be buried in a lead coffin at sea near Portobelo Bay. All British people know about Sir Francis Drake. It’s a mandatory part of being a citizen. The town hasn’t aged well since Columbus named it. Cindy asked for directions at a grocery store and we were pointed in the right direction. This is where thing started to go wrong. At the immigration office we started to fill out the forms. We had copies of our paperwork from customs as we were told we would need it. But, customs took our Colombian zarpe. A zarpe is a piece of paper given when exiting a country. It has the previous and next port listed on it and is used if we are boarded by authorities in route and also to determine the amount of time elapsed exiting one country and entering another (in case we stop somewhere else to smuggle something in). A zarpe shows everything aboard the vessel is legit. Immigration wants to see our zarpe and we no longer have it. Immigration also wanted copies of our passports. Specifically, they want copies of the pages showing the exit stamp from Colombia. Guess what, they don’t have a copier. The immigration lady checking us in didn’t speak English and our Spanish wasn’t enough to understand. She also didn’t seem happy about being at work. Google translate wasn’t adequate and was taking too long. Another lady asked us to wait and went down the street a little bit coming back with a man who was bi-lingual. I was glad she didn’t come back with the police. We are not sure if the translator worked for immigration, or not. He explained they would need a copy of the zarpe to proceed with the check in. We showed him the paperwork from customs and explained the officer had kept the zarpe. He said they would call him. In the meantime he said we could get the necessary copies of our passports at the pharmacy down the street, the location of the only public copier in Portobelo. We ventured off to find the pharmacy. While waiting in line, Cindy struck up a conversation with a young schoolboy who was eager to try out his English. He was cute as a button and had an infectious smile. As soon as we entered the pharmacy the young lady behind the counter had a pretty good idea why we were there. Apparently, we are not the only people to arrive without the required copies. She took our passports and knew exactly what pages to copy. We paid our 80¢ and made our way back to immigration with our rather blurry copies. Hey, they said they wanted copies. They didn’t specify the copies need to be legible. The bi-lingual gentleman was still in the immigration office and upon our return said they had talked to the customs agent who admitted he had not issued a copy of the zarpe to us. Since it was their mistake (that nobody ever admitted to), they said we could drop it off later in the week or even have another cruiser take it to them. We thanked him for all of his help and finally got our passports stamped. We are now legally in Panama. 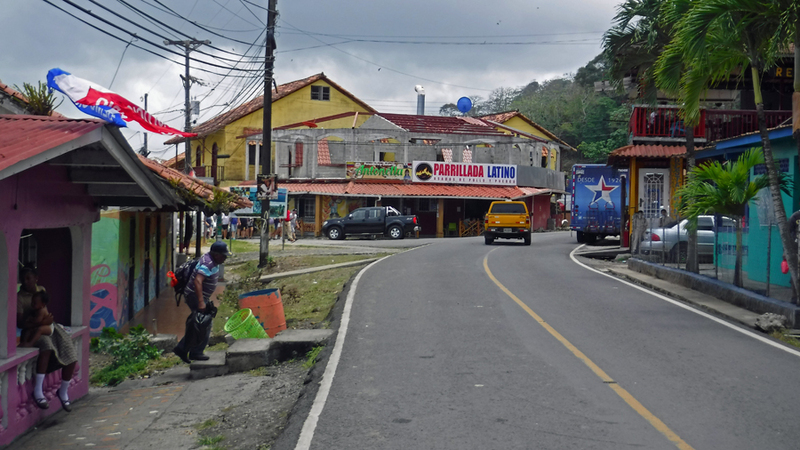 Down the street, the little market was packed full of American and British tourist who had just arrived in Portobelo on a tour bus. I am assuming they were part of a cruise ship excursion from a Panama Canal cruise, or not. They flooded the mini-market buying Coca-Cola and ice-creams. 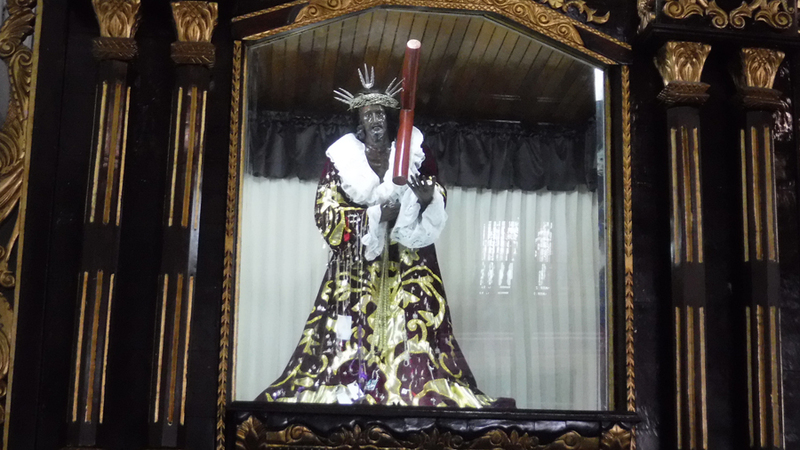 We had read this town is a tourist stop for people wishing to see the black Jesus at the local church. It was nice to hear people speaking English for a short time. The poor cashier in the store was overwhelmed by the sudden surge of people and did her absolute best to check them out before the ice-cream started to melt and drip onto the floor. We stood back and waited for the wave to ebb. A British lady was trying to explain she would like to buy denture cream. Saying it louder and louder and louder didn’t seem to help the cashier to understand her foreign request any better. Cindy stepped in to help. Her Spanish is getting better. They didn’t sell denture cream and the mini-market. It is very sad, not a single person took the time to say, “Gracias” to the cashier. Getting hungry we thought about eating in town but decided to head back to the boat instead. Rather than wait a couple of hours for a return bus we decided to take a taxi back to the marina. After lunch, when reviewing all our documents and preparing to put them away for safe keeping, we noticed the cash receipt from the customs guy stapled to the back of our cruising permit. We had paid him $230. He said we owed $225 but didn’t have change and couldn’t seem to get the safe open. We forewent the $5 change. The official government receipt stated he received $185 from us. I wonder what happened to the other $45. Welcome to Panama.